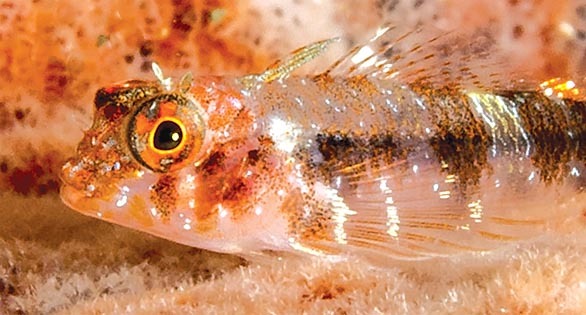 Enneanectes flavus, a new endemic species of triplefin blenny from the southeastern Caribbean. This specimen in Tobago. Image Credit: P. H. Humann. Triplefin blennies: you might have heard the name, but odds are you’ve probably never encountered one in the aquarium store. This is peculiar, as many online references suggest they are “popular in the aquarium trade.” However, if you were poring over wholesale lists from divers and importers around the country, you might think the triplefins were one of the aquarium hobby’s most overlooked groups of reef fishes. More on that in a minute. Their lack of popularity may simply be the result of unawareness. 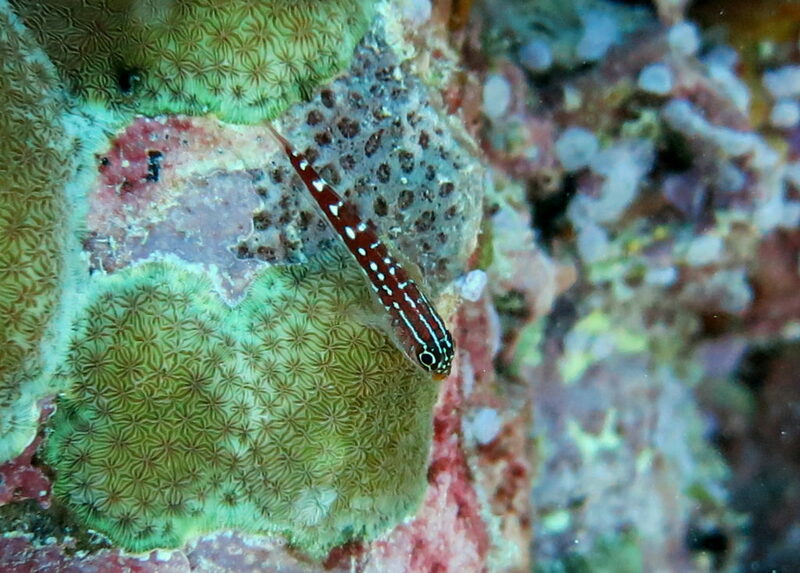 Triplefin blennies are likely great candidates for the reef aquarium hobby, with most remaining small in size and feeding primarily on small crustaceans, meaning our beloved corals will be left unharmed. Wondering why they’re called triplefins? It’s the three dorsal fins found on members of the family Tripterygiidae. Another interesting sidenote for all the marine fish breeders out there: many triplefin blennies are sexually dichromatic, which is always a plus when trying to create broodstock pairs. It’s a family ripe for breeding exploration, as the only member of the group to have been bred in captivity (as of our 2018 list) is a temperate species from the Pacific Northwest, Enneapterygius etheostomus. There is a whole range of both tropical and temperate triplefin species out there, waiting to be noticed and appreciated. A brilliantly colored Enneanectes matador, photographed in the Bahamas by F.H. Krasovec. The triplefin species list just received a new addition. 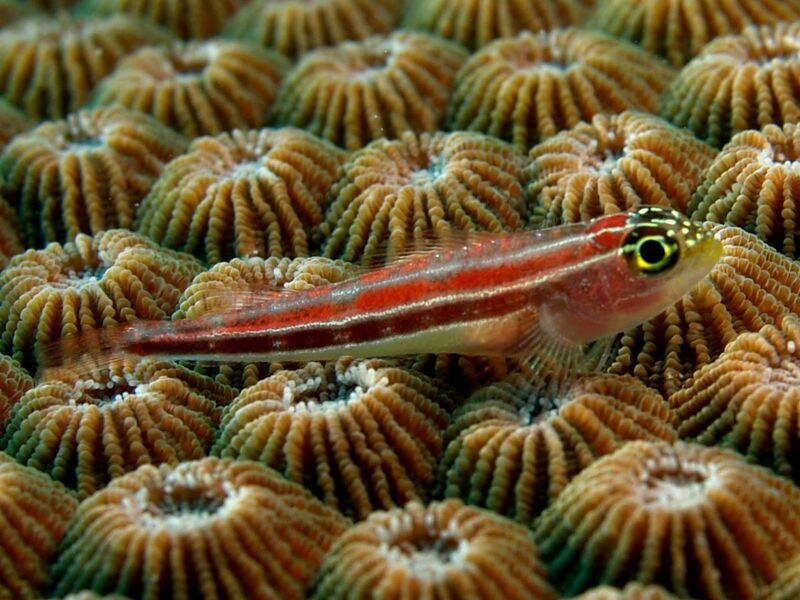 Researcher Benjamin C. Victor has recently published the description of a new tropical triplefin from the southeastern Caribbean: Enneanectes flavus is formally described in the recent Journal of the Ocean Science Foundation. This charming little fish has been dubbed the Yellowtail Triplefin. To date, the new species is known from Tobago, Islas Los Frailes, Islas Los Testigos, and the Paria Peninsula of Venezuela. Photos from St. Vincent show fishes suspected to be representatives of E. flavus as well. Benjamin Victor, Nova Southeastern University. Click for more information. For comparison, a female paratype of Enneanectes flavus, collected from the Paria Peninsula, Venezuela. Image credit: J.L. Van Tassell & D.R. Robertson. A male paratype of the Yellowtail Triplefin, Enneanectes flavus, collected in Los Frailes, Venezuela. It’s easy to understand how the triplefins earned their name, with the three dorsal fins clearly on display in this example. Image credit: J.L. Van Tassell & D.R. Robertson. Will you see the Yellowtail Triplefin in the aquarium trade? Probably not. We’re unaware of any active commercial marine aquarium fish collection and exportation from this particular region of the Caribbean. AquariumTradeData.org‘s reports reveal that over the course of their reporting years, only 288 fish were exported from Venezuela and Trinidad & Tobago combined. Even if there is any current export activity, efforts would more likely be focused on charismatic, in-demand species that are already popular in the aquarium trade; Pygmy Angelfish, Centropyge species, made up 265 (92%) of the marine aquarium fish logged in these countries’ export data at AquariumTradeData.org. Perhaps even more telling is that triplefins represent only 16,305 fishes exported over this same data period; Enneanectes spp. only have 7 individuals logged across all reporting years from all countries. Trade data from the Philippines shows most of these fish listed as Lepidoblennius marmoratus (Western Jumping Blenny), which is likely an invalid identification, as that species is native to Australia’s southern coast. It’s unclear what these Philippine exports actually are, and whether they’re even triplefins at all. Another triplefin of interest that’s barely present in the data and imported in very low quantities over the reporting period is a beautiful little triplefin endemic to the Maldives, Helcogramma maldivensis. There are other truly gorgeous species of triplefin blennies out there, and many make great candidates for our reef tanks and for breeding. The western Pacific Ocean, including Indonesia, is home to several truly stunning species, including Enneapterygius pyramis (Pyramid Triplefin), Helcogramma randalli (Randall’s Triplefin), Helcogramma striata (Tropical Striped Triplefin), and the unique Helcogramma vulcana (the Volcano Triplefin). Finding any of these beauties may be an exercise in extreme patience and luck. If you make the foray into subtropical and temperate species, there are even more colorful triplefin species you should know about. Helcogramma decurrens (the Blackthroat Triplefin) is a native of the western and southern coasts of Australia; males are bright yellow dorsally and black ventrally. New Zealand’s Notoclinops caerulepunctatus (Blue-dot Triplefin) is a surprisingly colorful temperate tidepool dweller. Those with access to marine fish from the Mediterranean or the Black Sea should absolutely take note of Tripterygion tripteronotum, the very appropriately-named Red-Black Triplefin. Don’t hold your breath waiting to see any of these in the aquarium trade, even among coldwater marine specialists. Triplefins just aren’t on the radar. However, if all of this puts you on the hunt for a triplefin or three, there is hope. The best chances might be occasional encounters with specimens collected out of Florida and probably offered up among groups of assorted blennies. Those Floridian species include Enneanectes altivelis (Lofty Triplefin), Enneanectes boehlkei (Roughhead Triplefin), and Enneanectes jordani (Mimic or Redbelly Triplefin). All these species occur in relatively shallow water and should be relatively accessible to collectors, but if no one ever asks for them, why would they bother collecting them? If this wasn’t enough already, consider this lone video we found of a Lofty Triplefin in a reef aquarium. It’s pretty low resolution, but check out the interesting behavior of this fish in a small reef tank! If you see a triplefin at your LFS, we encourage you to give it a try! Tell us about it in the comments! Victor, Benjamin. (2019). 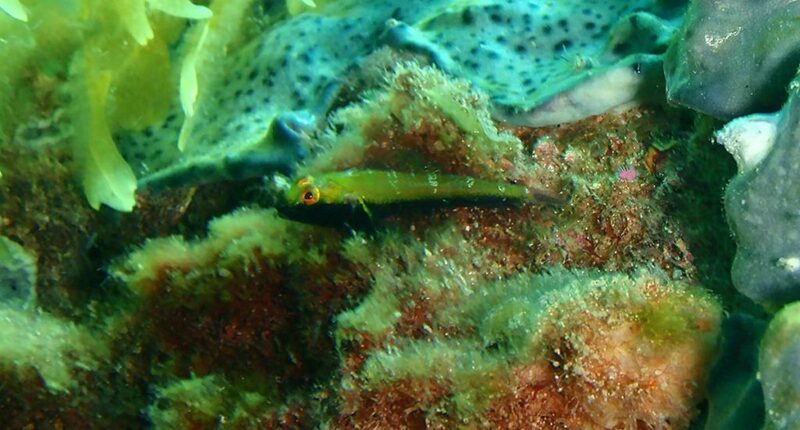 Enneanectes flavus, a new endemic species of triplefin blenny from the southeastern Caribbean (Teleostei: Tripterygiidae). 32. 1-16. 10.5281/zenodo.2533400. Read the open access species description of Enneanectes flavus now.